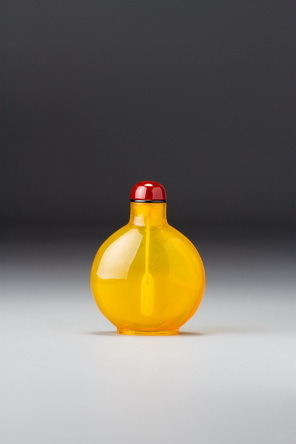 This yellow glass occurs rarely as an undecorated monochrome such as this, as a carved monochrome (see Sale 2, lot 153), or as a ground or relief colour for overlay glass bottles (see, for instance, Treasury 5, nos. 953 - 955). The cameo overlays can be dated with some confidence to the mid-Qing period, from the second half of the Qianlong reign into the early nineteenth century, by reference to their subjects, style, and the occasional reign mark. One or two of the carved monochrome examples may date from a little earlier in the Qianlong period. It is possible, however, that the colour predates most of these bottles. There is an intriguing reference from the imperial archives for 1727 (seventh month, twentieth day) describing a colour of glass as ‘yellow like honey-amber’, which would seem most appropriate. The yellow is unambiguous in this description, and since its transparency was one of the most revered qualities of amber, we may assume this to mean transparent yellow. Although there is nothing about this plain example to preclude an earlier date, if judged without knowledge of the carved and cameo-overlay examples, it fits comfortably into the Qianlong period—perhaps its latter part—although we have erred on the side of caution by leaving a broader dating range. It is in all probability from the imperial glassworks, but even if not, most likely to have been made for the court. Not only of a lovely colour, it is also impeccably well made. 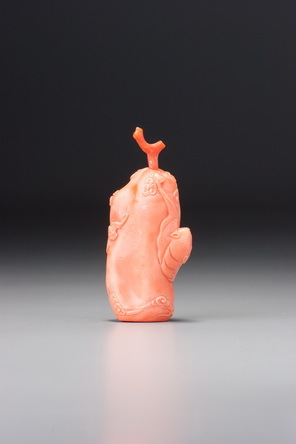 The inner bubble matches the outer contour well, and the carved detailing of the foot is particularly impressive for its complete formal integrity and crisp execution, both of which are features typical of the Qianlong period.